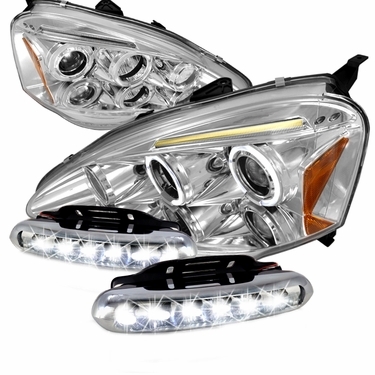 02-04 Acura Rsx' Projector Headlights With Angel-Eye Halo Rings (Left & Right). Our Projector Headlights Provide Intense Light Beam Concentration. Feature The Latest In Jdm Styling And Design, And Ease Of Installation. Our Projector Headlights Upgrade And Customize The Exterior Design Of Your Vehicle With The Latest Jdm Design. You May Change The Bulbs To Higher Opti-Blue, Hyper-White, Or Just Change The Real Xenon Light Bulbs. BRAND NEW 02-04 Acura RSX LED Halo Chrome Projector Headlights + Day Time Running Chrome LED Fog Lights! 2002-2004 Acura RSX Halo Projector headlights w/LED Eyebrows- Chrome provide a stylish custom improvement to your vehicle. These Acura RSX Projector Headlights with Halo Angel Eyes is crafted to fit, Made for Direct Replacement. Installing 2002-2004 Acura RSX Chrome Projector Headlights can deliver the advantages in both appearance and safety as it gives your car a Modified look at a fraction of the Cost while making your vision brighter and clearer.. 02-04 Acura RSX Projector headlights produce a more focused beam of light compared to most headlights. In the modern world of today projector headlights are found on all new vehicles.